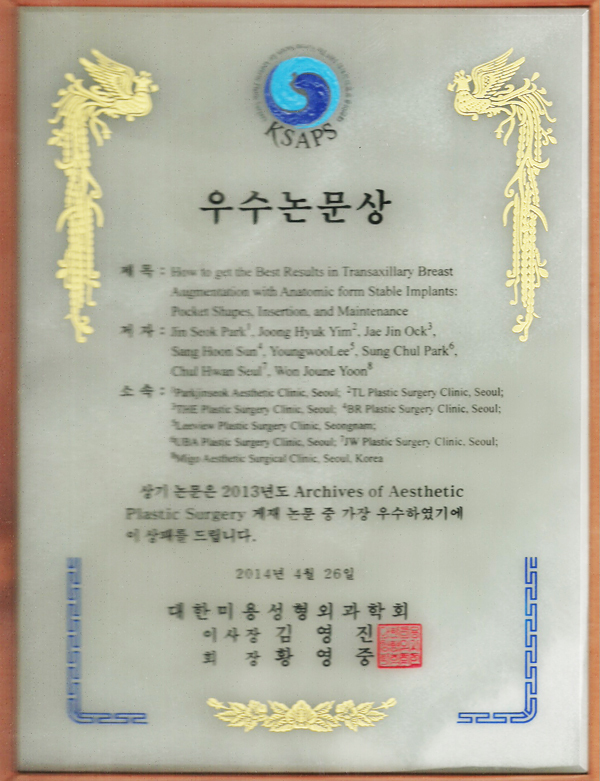 Park Jinseok got the Best Article Award of Archieves of Aesthetic Plastic Surgery in 2013, which is given to the one best article among all published articles in the year. 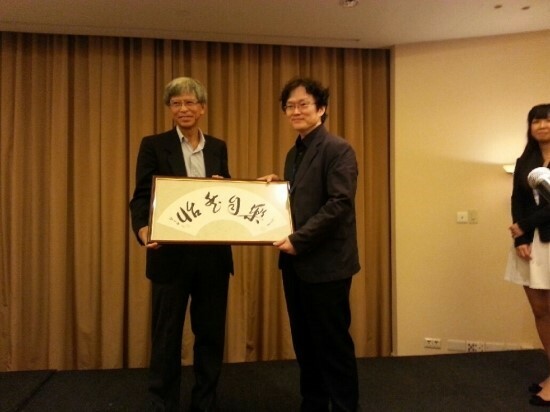 Dr Park was invited in 2013 South China Plastic Surgery Symposium, which held in Guangzhou China. Dr Park lectured about IMF Approach in Breast augmentation. Dr Park was invited in the 5th Asian Symposium of Breast Plastic and Reconstructive Surgery (ASBPRS) in Singapore. Dr Park lectured both presentation and live surgery of breast augmentation. Park Jinseok reported an article in AAPS Journal. 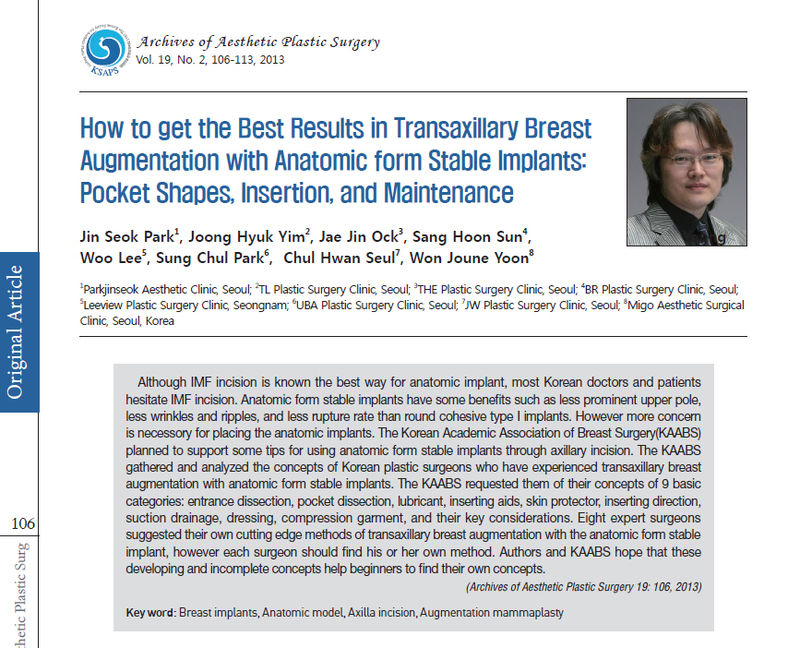 Dr Park collected idea from 7 other Korean wellknown breast plastic surgeons about Trans Axillary Breast Augmentation using Anatomic Form Stable implants and reported to Archives of Aesthetic Plastic Surgery Journal. 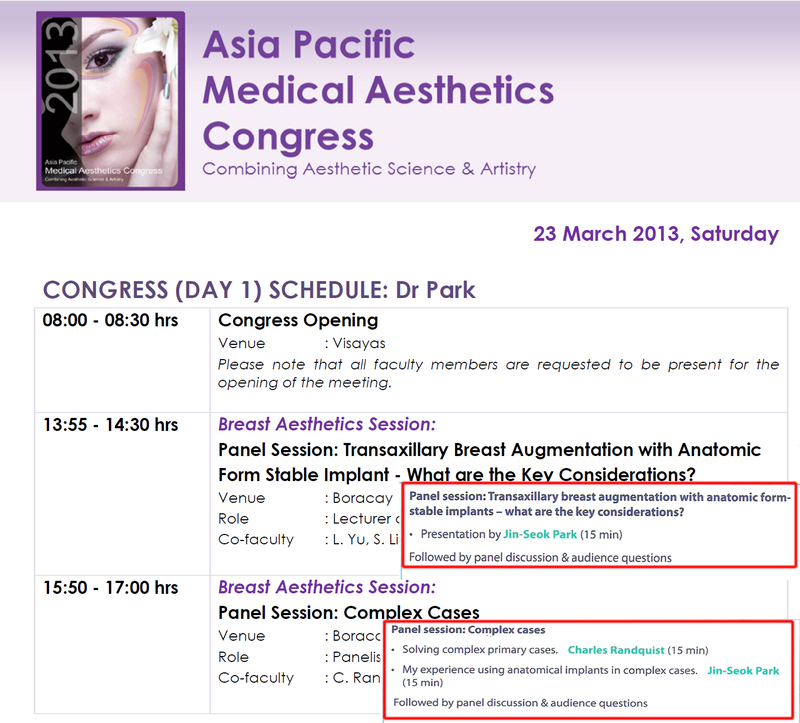 Dr Park was invited in APMAC2013 ( Asia Pacific Medical Aesthetics Congress ) of Manila Philippines. 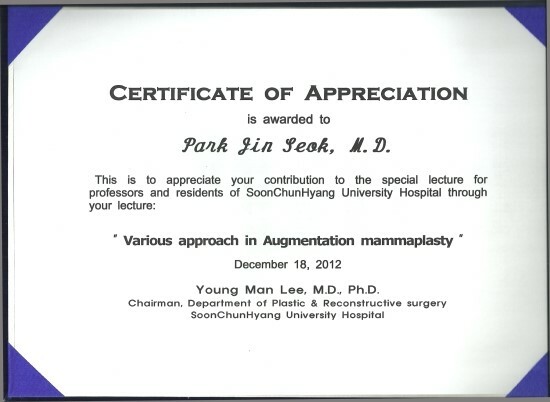 Dr Park lectured 3 subjects of Breast Augmentation. Park Jinseok was invited and lectured in Soon Chun Hyang University Hospital December 18, 2012. He lectured about Breast Augmentation using Tear drop shaped implants. 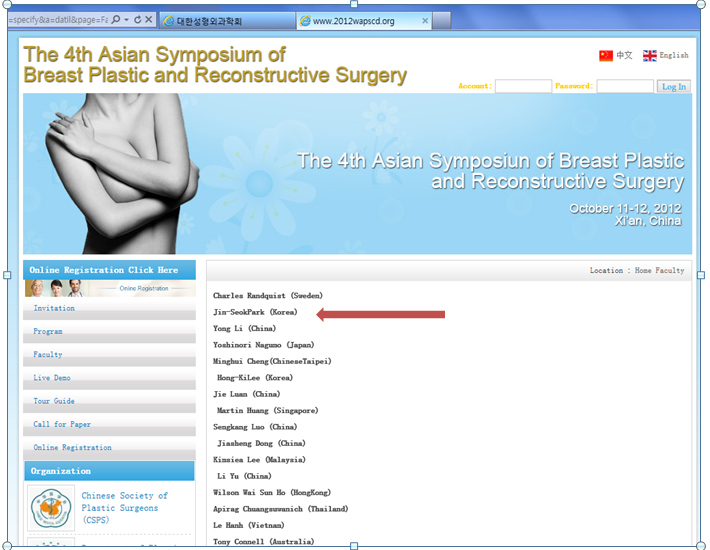 Dr Park was invited in the 4th Asian Symposium of Breast and Reconstructive Surgery which held in Xian China. On September 15, 2012, there was N410 launching Allergan Academy. 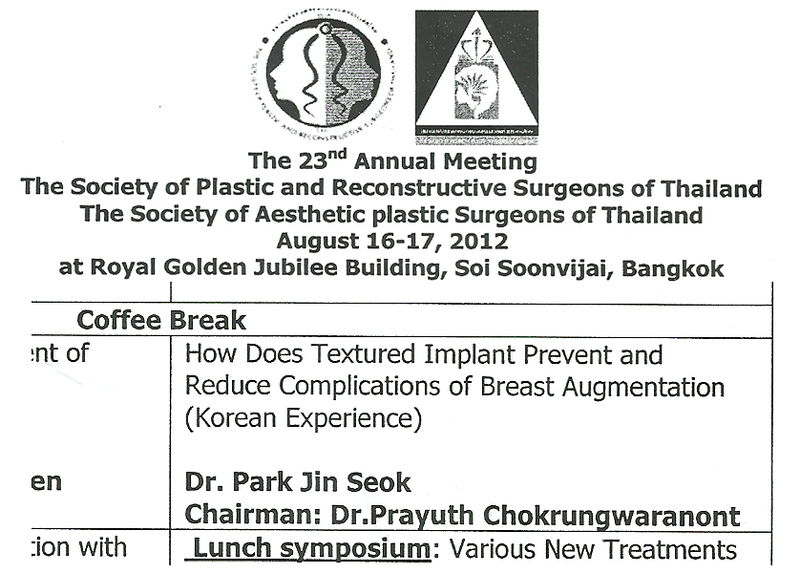 Dr Park was invited as an lecturer in the 23rd the Society of Plastic and Reconstructive Surgeons of Thailand which held in Bangkok. The Title of lecture is "Textured implants"